Rinse and drain seafood thoroughly. Shred crab or chop shrimp to make about 1 cup; sprinkle lemon juice over seafood. Beat cream cheese and seasonings until smooth and creamy. Stir in seafood, chestnuts, and onions. Place a scant teaspoon of seafood mixture in center of each wonton wrapper. Brush edges of wrapper with lightly beaten egg white or 1 tablespoon flour mixed with 2 tablespoons cold water. Bring the 4 corners up over filling and pinch together. Pinch edges together and shape to resemble a pinwheel. Keep covered as you work. 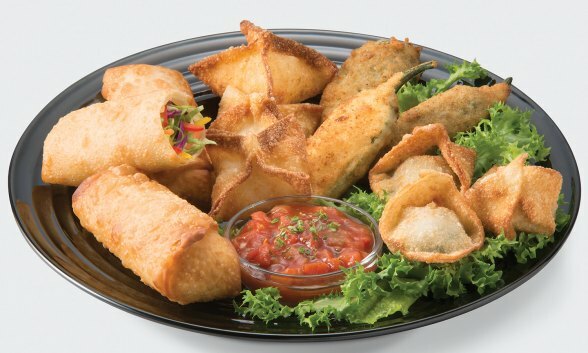 In Presto® electric deep fryer, deep fry 3 or 4 pinwheels at a time for 2 to 3 minutes.